If you’re the type of beachgoer who wants a patch of pristine sand and sea all to yourself, head to Johnson Beach in the Gulf Islands National Seashore. There are a peacefulness and tranquility to the beach here. Away from the crowds and condos, it’s nice and quiet and secluded. The only thing you can hear is the sound of the gentle waves lapping up on shore and the caw of distant seagulls. When you first drive through the main gate, there are about 2.5 miles of drivable road, with the main parking lot, a visitor center, restrooms and picnic tables in the first quarter mile or so. For a stroll along the seashore, the park’s Discovery Trail offers a boardwalk connecting the Gulf-side pavilions to the Intracoastal Waterway. 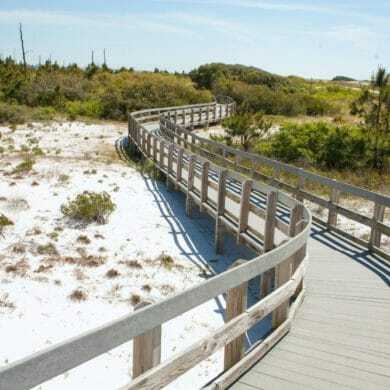 It’s an accessible trail, so you can take wheelchairs and strollers along the entire length – crossing a salt marsh, maritime forest and rolling dunes. It is a beautiful hike, albeit fairly short. Along the way, there is an overlook of the marsh, where an informational board highlights its inhabitants. Take a breather on the benches while you listen to the overhead pines swaying in the ocean breeze. Beyond the trail, there are places to park on the side of the road, to enjoy the beach in either direction. The drive itself is an experience, at times with only 75 to 100 feet of beach between the road and the water. Many people choose to park in the main parking lot and either jog, bike or hike the rest of the road. There’s no roadside parking during the last half-mile, but you can still drive that portion and head back by way of a circular roundabout. Beyond the road, there are at least five miles of unspoiled beach beauty. Imagine hiking for a mile without anyone around. Fort McRee is at the end of the island, but that would be a very long trek by foot. (We know someone who survived the journey.) It would, however, be lovely by kayak. Here, there are wonderful opportunities to view Coastal Alabama wildlife. We’ve seen blue herons perched atop the dunes, and dolphins swimming near the fort. If you have any interest in photography, pack your camera and prepare to capture some truly wondrous territory. Parts of the beach are roped off in summer months due to shorebird nesting season. Do not disturb the nests unless you’re prepared to be both pecked and heftily fined. Take everything you bring with you when you go. There’s a saying in these parts: leave only your footprints. You’ll be glad to have made footprints in the sand … and memories in your heart.